Christmas in my family room looks totally different compared to Christmas in the dining room. That’s because I have a lot of Christmas decorations that I’ve accumulated over the years that I still love and want to use. 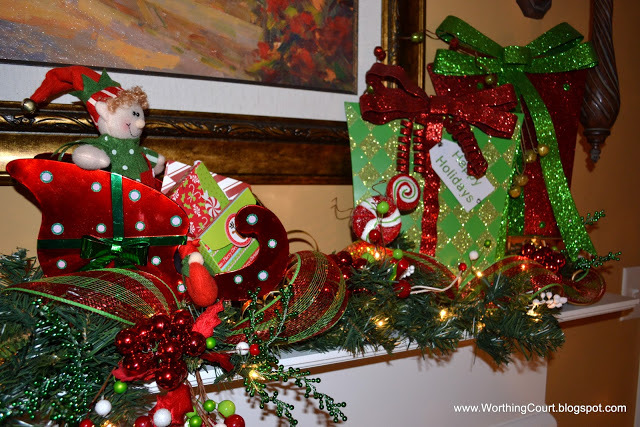 The older decorations are more traditional so I usually keep them in the living room, dining room and foyer. BUT, in family room and kitchen I like to have fun! I want to keep things whimsical for the children that will be present at the Christmas family get-together at our house. This year they range in ages from three to eight. I’ve been adding more and more of the apple/lime green and red over the last few years. 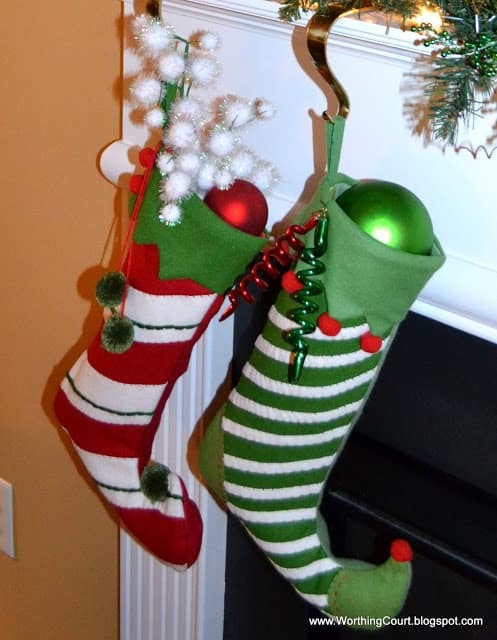 I love these whimsical stockings! I added some ornaments and a fuzzy white stick to make them a little more interesting. This is the first year that I’ve ever had lights on my mantle. The thought of the electrical cord hanging down one side really bugged me. One day it finally occurred to me that I could use some Command Strips with small hooks to hold the cord against the woodwork. You really can’t see them unless you walk behind the tree. 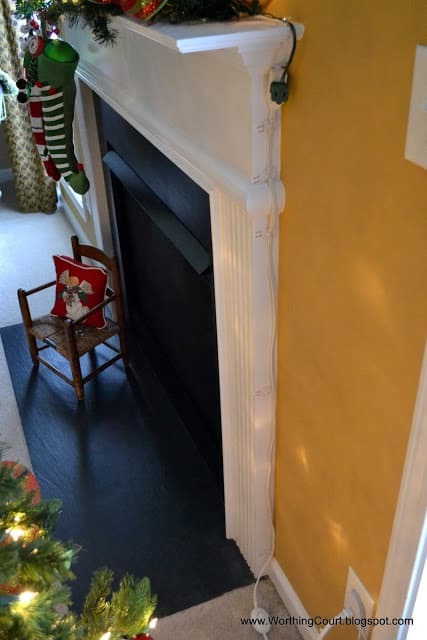 The nice thing is that I know they’ll pull right off without taking paint with them once Christmas is over. 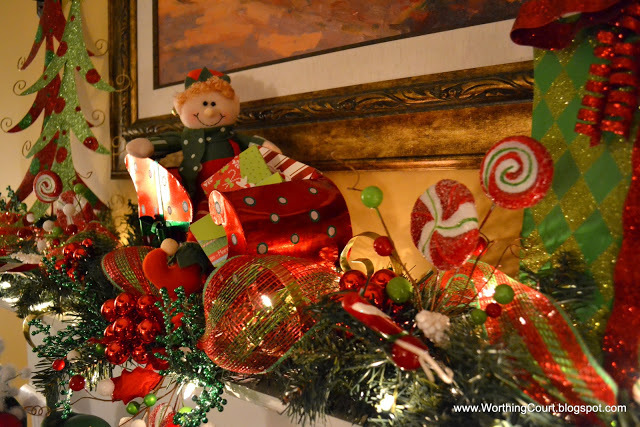 So there you have it – my fun Merry Christmas mantle! I’ll be joining these parties! Suzy, what pretty and whimsical decor!! I get so much eye candy each time I come over! I love the bright reds and greens; and you do them beautifully! This is so fun! The little ones will love it! So cute, I know the children will be wide eyed at this! 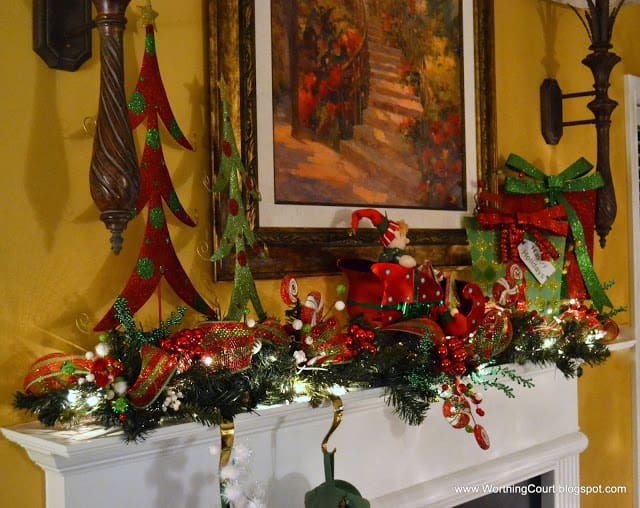 Your mantel is like a magical Christmas wonderland! I love it! Suzy – its adorable. So playful and fun and colorful. My grandsons would adore this! Your visitors, both young and old, will love it! I love it!! So cute and whimsical! Too cute GF!! I want to come see!! Where did you find the trees and stockings? The trees came from a Christmas shop (Salem Creek) in Winston Salem and the stockings came from Steinmart (on sale!). Beautiful job on the mantle Suzy!! So fresh and fun! I love it! Thanks for joining us at Home for the Holidays! Merry Christmas! Whimsical, colorful and totally fun — that just about sums it up! Love how you displayed all your wonderful decorations. I totally love command hooks — best invention ever! Your dining room is amazing! It’s so elegant but still warm and charming. Your nativity is beautiful. Thanks for the tour! 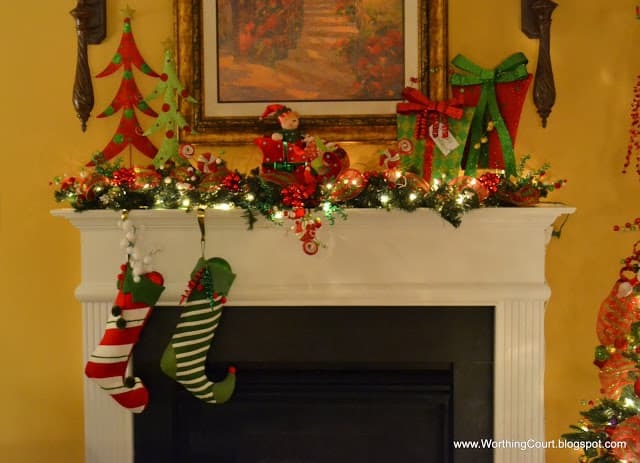 Your mantle is GORGEOUS!! Great job putting it together!!! Your mantle is fabulous and soo professional looking!! Love how it has such a personality and is so festive. Well done!! 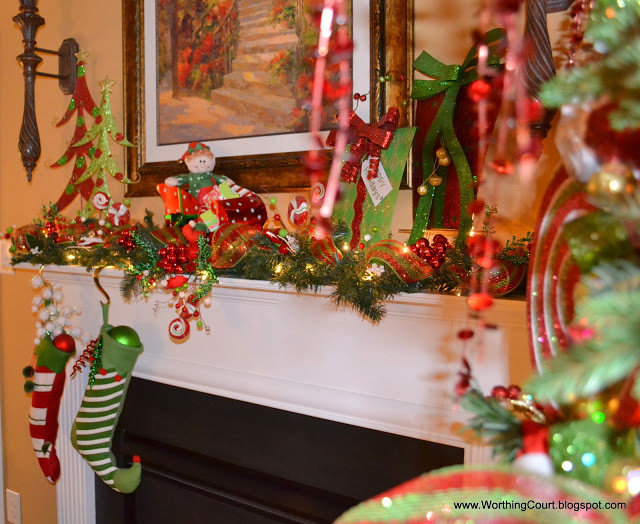 The mantel is so fun, festive, and whimsical! SO cute! 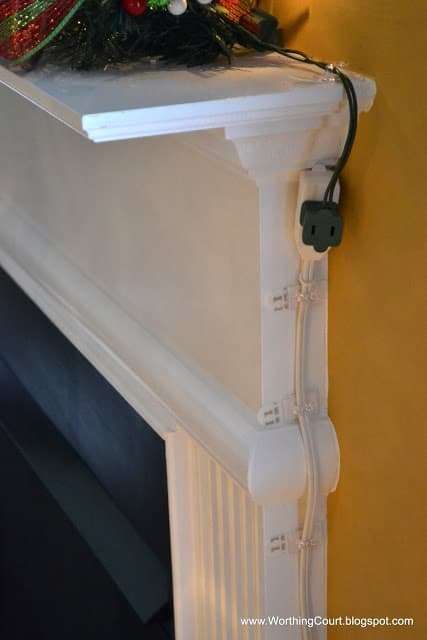 And what a great idea with the cord and command strips! Glad you shared that idea! Suzy, Love you mantel and I love the apple green. It is so refreshing. I love the trees and the stockings are too cute. The command strips are a great idea. I didn’t put lights on the mantel but I have in years past and yes the cords bug one. So cute and the children will love it. 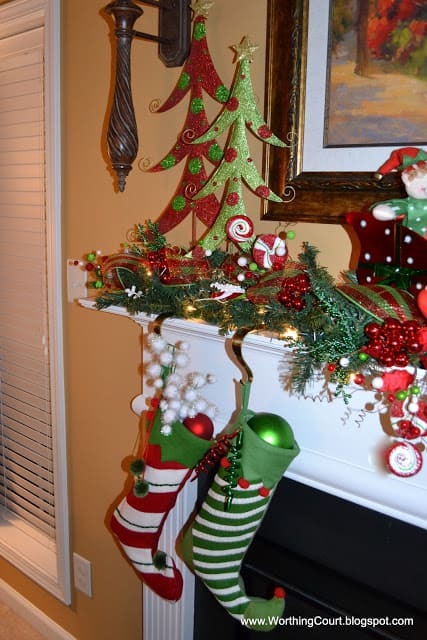 Your mantle is so fun and classy at the same time, I love love love your stockings. Very fun and whimsical, Suzy! Love those trees and the little elf. Great idea to use the command hooks for the cord! This is delightful and cool idea for the cord! You mantle is soooo much fun!!! Love it! I would be thrilled if you shared this at my new link party!! Loving that lime green and those stockings with the curled up toes made me smile. That is good to know about the command strips. Will have to remember that. Thanks so much for joining the party!